Profe Staple was raised in Northern California in the high Sierra Nevada Mountains. She and her twin sister are both teachers, as well as the youngest of four girls. 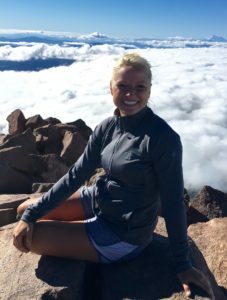 Sports, adventure, travel, and the outdoors were an integral part of their upbringing. After high school, Profe studied Spanish in Argentina for a year as a Rotary Foreign Exchange Student. When she returned she played basketball at College of the Siskiyous and received All Conference. At each grade level, games are taught to develop physical skills, mental agility, and social cohesion. Games class develops a sense of formation – how players position and conduct themselves in a team setting. Gymnastics and fitness activities demand all-around skill, spatial awareness and courage. 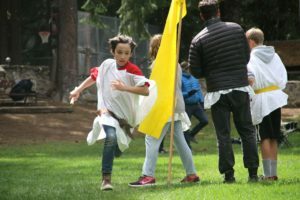 In fifth grade, the Greek Games build on the social studies lessons in the classroom. A seventh and eighth grade track meet provides another opportunity for the students to challenge themselves. Born into this world in Massachusetts, T I’m was steeped in Yankee ingenuity and a desire to brave new frontiers. Raised in a rural setting fostered a kinship with the natural world. This opened a teaching opportunity at a local nature sanctuary during high school. From there began a quest for a degree in Environmental Management that took T I’m through Maine, Ohio, San Salvador Island and Siberia. Captured by the travel bug, T I’m has continued a search for insights from the four corners of the earth, including South Korea, Indonesia, Australia, Costa Rica and Brazil. Trained as a carpenter, T I’m has worked with his hands from the east to the west coasts. Reflection after a back injury building movie theaters emerged the theme of working with children around the world. With a teaching degree manifesting from Southern Oregon University shortly after, T I’m has taught as the Life Skills Trainer and Vocational Coordinator at the Lithia Springs School, trained teachers and children on science inquiry throughout the Rogue Valley for Scienceworks, led children on interpretive hikes as a Ranger on the Table Rocks for the BLM, and helped to make things grow while cultivating relationships with the nature spirits as the Activities and Outreach Coordinator with an Ashland farm servicing area schools. A brief experience as the grade 1 assistant at the Siskyou School fanned the flame of curiosity with Waldorf education. Though T I’m’s path veered, taking him away from the classroom to start a family and small goat dairy, an affinity with the ideas of Rudolf Steiner continued to take root. A recent call for substitute teachers beckoned T I’m to return to the classroom. As his path crossed with the Madrone Trail School, he could sense that there was something greater underfoot. T I’m enjoys a bit of healthy mischief with his son and bride, flying kites, riding bikes, kicking a ball, throwing a frisbee, sticking his bare feet in the dirt, and sleeping under the stars. As human beings, we use our hands regularly in our daily lives. Handwork as an integrated part of an educational program, however, is taught almost exclusively in Waldorf schools. Here the Handwork curriculum is broad and includes, but is not limited to, skills such as knitting, crocheting, hand sewing, embroidery, felting, pattern design, and machine sewing. Many of the benefits of the Handwork program are obvious: hand-eye coordination; basic math skills such as counting, the four math processes, and basic geometry; the ability to understand and follow a process from concept to completion; and the ability to focus on a project for an extended period of time. There are also more subtle rewards that complement these obvious benefits. Students must prepare and care for materials. Many of the created items have a practical use—a case for a flute, a pencil holder, a hat, or a pair of socks. Throughout the process, respect is fostered. Creativity is encouraged through design and color choice. Handwork in each grade also embraces where the child is developmentally and has its basis in the Waldorf pedagogy. The handwork curriculum often mirrors what the students are exploring in main lesson. First Graders learn to knit on needles they have made. Their first project is a square which becomes a butterfly. They then make a flute case. Knitting uses both right and left hands, and brings a steady, calming rhythm to the younger child. In Second Grade the students continue their work in knitting. They learn to purl, cast on and cast off. They create knitted animals and a gnome. In Third Grade the students learn to crochet, which emphasizes the right or left hand. They start with making a square for a group project or to use as a wash cloth. They then learn to crochet in the round, making a pencil case. The second half of the year, we introduce the children to the making of cloth, from sheering a sheep, to carding, dyeing and spinning wool. This unit culminates in weaving a piece of cloth on a cardboard loom. Fourth Graders start the year designing a handwork bag. They learn several stitches in the process of making the bag, including chain stitch, backstitch, hemstitch and blanket stitch. 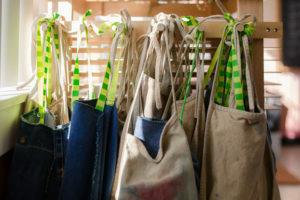 They create a bag that they will use through eighth grade to hold their handwork projects. Then they learn cross stitch and create a pin cushion. Fifth Graders return to knitting and learn how to knit in the round, to make a hat or socks. In sixth grade the students sew three dimensional soft fabric animals. This requires planning, patterns, cutting and other skills. They are deepening the sewing skills they learned in 4th grade. The seventh grade curriculum for handwork is another example of beginning with an understanding of where the students are developmentally, and designing a project to meet them there. In this way the students balance out and work through some of the difficult aspects of the age. In seventh grade, the child is on the verge of adolescence: bodily, hormonal and emotional changes are just beginning. There is commonly a corresponding inner experience of uncertainty. At this moment, when final, somewhat longing, glances are being cast over their childhood, students, as indicated by Steiner, should make dolls in their own, childlike image. The seventh graders continue developing their hand sewing skills and journey through all the stages of making a doll. In Eighth Grade the Industrial Revolution is studied, and this is when machine sewing is introduced. Coverings for the feet, hands and head have been previously made, and now is a good time to make garments to clothe the body. A discussion of the structure of the woven fabric is followed by body measurements and the puzzle of how to turn a flat piece of fabric into a 3-dimensional garment. The first project is a basic pillow case. Then they move into making pajamas, and learn how to follow a commercial sewing pattern, cut and mark fabric, and sew a garment. Often the students complete a third project of a simple quilted pillow cover. Nancy was born and raised in Pasadena CA. She loved working with her hands from a young age, starting with crochet, macramé, and sewing and moved on to weaving and knitting. Her parents enjoyed traveling and took her family on many adventures in the states and to Mexico. Nancy discovered the colorful markets in Mexico, mesmerized by the piles of textiles, full of intricate patterns and vibrant colors. Nancy moved to Montana after spending a summer working in Yellowstone National Park. She attended the University of Montana and graduated with a degree in Visual Art with an emphasis in Fibers. She spent several summers during college working at Idyllwild Arts Summer Program, assisting Native American artists Blue Corn, Lucy Lewis, Rainbow Stevens and Juan Quezada. After graduating college, she joined the Peace Corps and spent 4 years working with a women’s weaving cooperative in Walkerswood, Jamaica. Nancy traveled to Peru, Ecuador, and Guatemala to travel and study with weavers. Nancy returned to Montana and ran a weaving program for adults with physical challenges. Nancy studied tapestry weaving with Rebecca Bluestone in Taos, New Mexico and purchased her first floor loom in Taos. Nancy taught weaving classes at the local yarn store in Missoula and later in her studio. She also started creating and selling her own weavings at craft fairs. 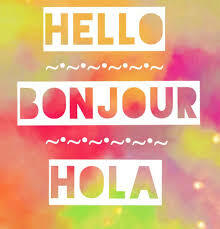 Nancy returned to the University of Montana and received her teaching certificate in Art and Spanish. She spent 5 years teaching Spanish and Fibers at Idyllwild Arts Academy and 4 years at Sentinel High School in Missoula. Nancy led student trips to Mexico, Ecuador, and Peru. Nancy took leave from work for 6 years while raising her son, Logan, and discovered Waldorf Education. She was part of a group of parents to initiate a Waldorf School in Missoula which now has a preschool. Nancy continues to explore work with fibers. She is passionate about the need to teach children to use their hands to create works of beauty. She completed the Waldorf Handwork Teacher Training Program at Rudolf Steiner College. She loves to spend time with her family and friends, going on fun adventures to the coast, to the mountains, and to Latin America. She always carries a ball of wool in her handbag to create a new piece of beauty. 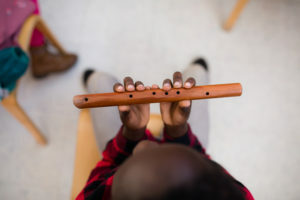 First and second grades, our class teachers introduce the pentatonic flutes, and all the children learn to play simple melodies together by the end of second grade. This instrumental work is brought through stories and pictures rather than through theory and conscious technique. In second grade the music teacher introduces the pentatonic lyre, singing games and experiences of the elements of music; recognizing light and dark, high and low, fast and slow, soft and loud. Beginning in the third grade, the children are ready for quite a different approach to music and music-making. The third graders begin note reading, look at the instrument families and experience playing and singing in parts, beginning with simple rounds. Starting in fourth grade, the students learn how to play a stringed instrument, and each class is a self-contained orchestra. Singing in rounds, multi-part pieces, as well as individual performances, are featured in the upper grades. Cori Gibson has 33 years of experience teaching music. She believes it is the most rewarding profession. She especially loves teaching movement with singing because it frees up the voice and brings joy to the singer. As part of her philosophy, she emphasizes reading music. She loves when the students realize, in a short time, that they can play a song on an instrument. She also teaches at Sacred Heart and does after-school private lessons. Mrs. Gibson is so happy to be a part of the Madrone Trail School Community and looks forward to meeting all the parents at the school concerts. I am the maker of vessels and tools. But what is the source of my power? Is it my heart that seeks the true? Are equal to the task. Joe was born and raised in Lawrence, Kansas. He spent much of his childhood camping, hiking, canoeing, and building a deep appreciation for the outdoors in the Boy scouts. The son of a carpenter, he grew up with tools in his hands. Joe attended the University of Kansas and earned BAs in Environmental Science and History. During college he became interested in gardening and farming and coordinated a campus garden that donated produce to a local food pantry. He also spent extensive time doing research in Latin America on agriculture, environment, and oral history. He continues to travel back when opportunity allows. 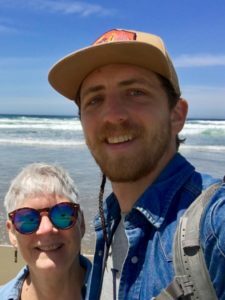 After graduating Joe embarked on a self-led curriculum of “learning by doing” that he has pursued since. He spent three years helping to build an educational farm connected to a hotel outside Austin, Texas. This provided opportunity to gain experience in annual production of organic vegetables and developing and teaching farm-based curriculum to guests. Teaching applied experience-based subject matter inspired him to find more opportunities like it in the future. Joe moved to Oregon two years ago and has been working in construction and farming since his arrival to the valley. His love of woodwork and interest in connecting school curriculum with real world projects led him to Madrone Trail. Joe loves spending his time in his garden, kitchen, and front porch playing music. When not working he can be found hiking and camping, spending time with friends, or building and fixing things at his house.